Move right into this Like New, Immaculate, Split Bedroom, Open Floor Plan. 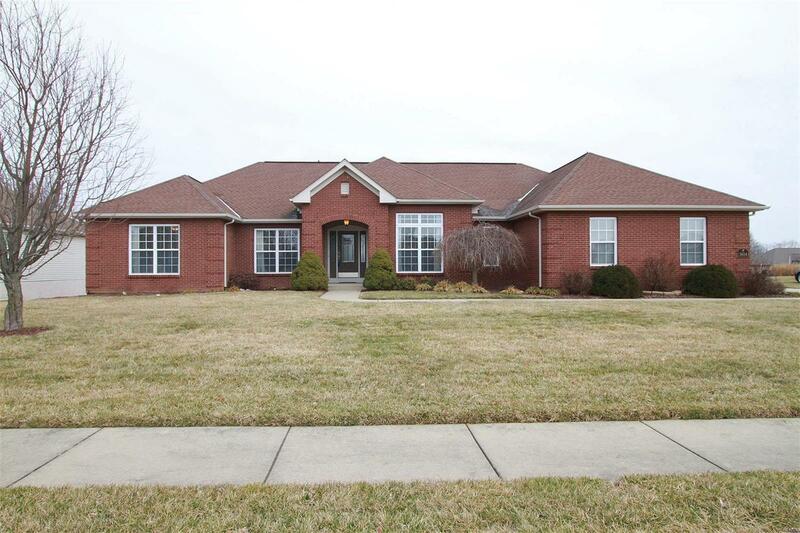 Three Bedroom, Two Bath Ranch in Woodfield Lake Estates! Covered Front Porch greets you. Entry foyer flanked by a Large Dining Room w/ wood floors, 10' dbl. coffered ceiling & spacious Living Room/Study w/ vaulted ceiling. Wood floors lead to the Great Room w/gas fireplace, soaring ceilings, & Wall of Windows. Gourmet Kitchen w/staggered cabinets, center island w/granite, stainless appliances, & pantry-opens to the breakfast area w/patio door to the Deck-overlooks massive yard. Master Bedroom suite w/ dbl door entry, plush bath w/garden tub, walk-in shower, dual vanities & large walk-in closet. Nearby oversized Laundry room includes washer & dryer. Additional two bedrooms on other side of home have walk-in closets & share a full bath w/ dbl sinks. Walkout Lower level w/full sized windows, door to lower patio, &dbl doors, has roughed in bath & lots of potential. Enjoy the nearby Common Grounds, Lake, & Pavilion.